1. 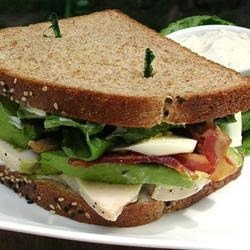 Prepare the sandwich spread by mixing together the mayonnaise and blue cheese dressing. Spread 2 tablespoons on one side of each slice of bread. Top 4 of the prepared pieces of bread with 1/4 each of the chicken, avocado, bacon, hard boiled eggs, and lettuce. Top each sandwich with another slice of bread and serve with the remaining blue cheese spread on the side.